Kalinga Institute of Medical Sciences (KIMS), Bhubaneswar and Sir Ganga Ram Hospital (SGRH), New Delhi have collaborated to provide best healthcare facilities to the people of Odisha at their doorstep. SGRH will provide high end medical expertise and treatment facilities which are presently absent in state of Odisha, as per terms of the agreement. Some of these advanced technology will be in the form of Robotic Surgery, Kidney, Liver & Heart Transplant, Complicated Heart Surgeries in children, minimally invasive surgery of spine (Keyhole surgery of spine) and many more, informed senior doctors from SGRH and KIMS here on Sunday. A special health camp (OPD) was organized in KIMS earlier this day, where more than two hundred patients of advanced disease examined by the doctors of SGRH. Also a Telemedicine link between the two hospitals was inaugurated by Dr. Achyuta Samanta, Founder, KIIT & KISS and Dr. D. S. Rana, Chairman (B.O.M), SGRH. Senior doctors from SGRH – Dr. Naimish Mehta, Senior Liver Transplant Surgeon; Dr. Shankar Acharya, Senior Consultant, Department of Orthopedic & Spine Surgery; Dr. Raja Joshi, Chairperson, Pediatric Cardiac Sciences; Dr. D. S. Rana, Chairman, Department of Nephrology; and Prof. Arvind Kumar, Director, Institute of Robotic Surgery – provided expert consultation to patients at the first of its kind OPD programme. Senior Consultants in various specialities also conducted a medical education program for 300 doctors from different parts of Odisha. “One stand-alone institution alone cannot have all aspect of health care at one place. Keeping this in mind the two institutions have joined hands to provide the best in healthcare to the people of Odisha”, said Dr. D. S. Rana, Chairman(B.O.M), SGRH. Pradyumna Bal Memorial Hospital of KIMS has always been at the forefront in providing the best healthcare to the people of Odhisha. KIMS intends to connect all 30 districts of Odhisha through telemedicine network with its health care facilities. This network will further be connected to Telemedicine room at Sir Ganga Ram Hospital for high end expert opinion from SGRH consultants. Only a small percentage of patients, who need high-end tertiary care not available in Odisha, will be treated at Sir Ganga Ram Hospital. “KIMS is committed to provide the best health care facility to the people of Odisha at their doorstep and collaboration with SGRH is yet another step in this direction. It will continue to provide advanced health care facility at most affordable price”, said Dr. Achyuta Samanta, Founder, KIIT & KISS at the press meet. 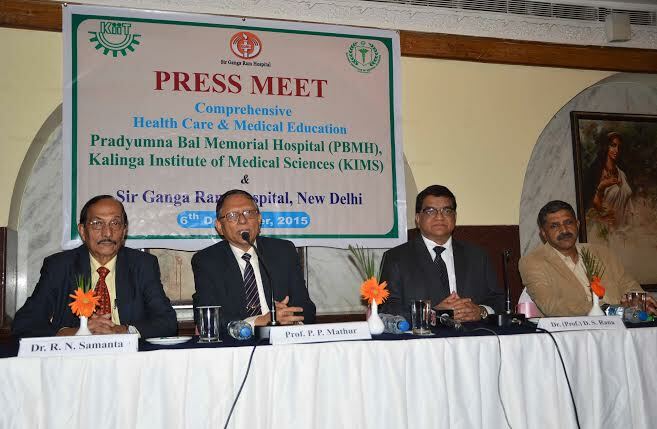 Both institutions will also work together for promotion of Medical Education and Research, said Dr. S. Nundy, Dean, GRIPMER, medical education & research wing of Sir Ganga Ram Hospital. Among others Prof. P. P. Mathur, VC, KIIT University and other dignitaries were present in the press meet.